Semifreddo is a quick and easy Italian ice cream that requires no special equipment or faffing around with stirring half-frozen custards. It’s a stylish dessert to have up your sleeve, or should we say in the freezer, for last-minute guests. 1. Line a 1.2 litre pudding basin with a double layer of cling film, leaving the excess hanging over the edge, and set aside. Make sure there is space in the freezer for the basin. 2. Melt half of the dark or milk chocolate in a small heatproof bowl set over a pan of simmering water or in the microwave. Set aside to cool. 3. Put the egg whites in a medium bowl and the yolks in a large one. Add the vanilla seeds to the yolks along with the sugar and whisk until the mixture is pale. 4. Whisk the egg whites with a pinch of salt until firm peaks form, making sure you first clean and dry the beaters or whisk thoroughly after mixing the yolks. In another bowl, whisk the cream to soft peaks. Stir the whipped cream into the egg yolk mixture before gently folding the egg whites through also. 5. Divide the mixture in half and stir the melted chocolate through one of them along with two-thirds of the Christmas chocolates. Crumble the Christmas pudding into small pieces, reserving a small handful for serving, and fold the remainder through the second half of the mixture. 6. Spoon the chocolate mixture into the pudding basin, spreading it smooth. Spoon the remaining mixture over, spreading the top level. Cover with the excess cling film and pop in the freezer for at least 8 hours or overnight. 7. Remove from the freezer about 30 minutes before serving. Peel back the cling film, invert a serving plate or cake stand on top and carefully tip the whole thing over. 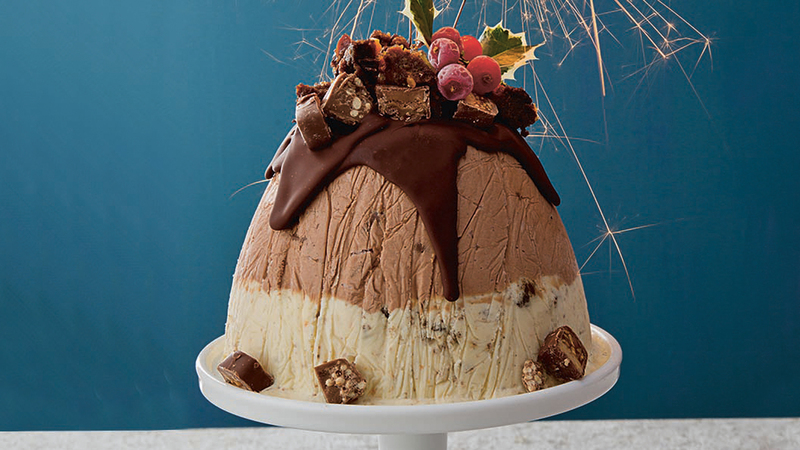 Remove the pudding basin and cling film to reveal the semifreddo pudding. 8. Melt the remaining chopped chocolate as before and leave to cool a little. With the remaining chopped Christmas chocolates and crumbled pudding standing by, spoon the melted chocolate over the top of the pudding. It will set quickly, so immediately sprinkle the Christmas chocolates and crumbled pudding over to stick. Decorate with a string of redcurrants if liked.